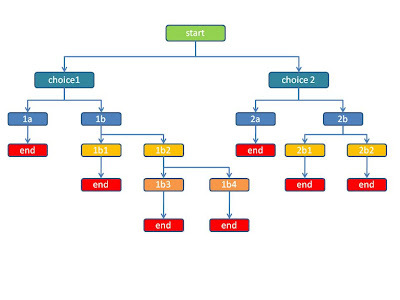 Use the flowchart to generate multiple outcomes at each turning point in your story. Check that your characters are making decisions which move the story onward. I have found this flowchart to be a good guard against passive main characters who simply react to external events. The format forces them to choose one path or another. The link below allows you to download the chart for editing and adding your own stories to. There is also a link to return to the Jigsaw Novel pages. I cannot take credit for this – the original design belongs to the above website: I have simply presented their design in PPT format.